My parents frequent a local coffee house. My mom uses a coffee cozy that I made for her when she gets coffee there. I guess the owner had expressed some interest in the cozy so my mom was nice enough to do a little PR work for me. 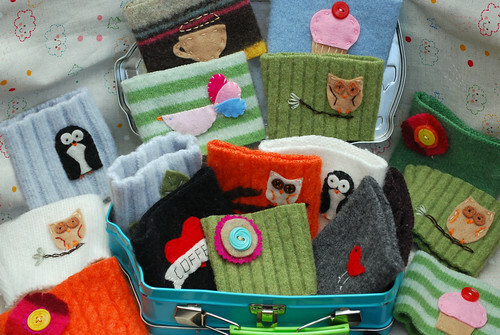 She put me in touch with the owner and she placed an order for 25 coffee cozies. So guess what I have been doing this week? I really enjoy embroidering and appliqueing the cozies. I can do a few here and there and once I have the sleeves all ready it goes pretty fast. I still have 5 more to do. Here's a peek at what I have so far. I have a bunch of sleeves waiting to be appliqued so hopefully by next week I will have my shop updated with some new ones. I sold Daisy and May and both are in the mail to their new homes. I am kinda sad to see them go. I am SO loving your owl appliques (sp)!!! They are adorable. The little penquins are pretty cute too. Congrats on the orders. That's great! And you know how much I LOVE mine. Cozy is the perfect word for them, because they are just so cozy...they make me happy! Nice work - as always, may it lead to many more! Yay for you! That is fantastic! That is so great. They are gonna catch on like wild fire. That's awesome Jen! I am loving the penguin ones. How great to get a "bulk" order! They are all just adorable, and each one unique. At the rate you're going, you'll be doing this full time before the year is up! Yay for you Jen! That must have been so exciting to get that order. I am guessing they will fly off the shelves and you will have another order in no time! What a fantastic opportunity for you! Who wouldn't love them, they are fantastic. a friend just gave me one of these with 2 little birdies and I simply LOVE it!